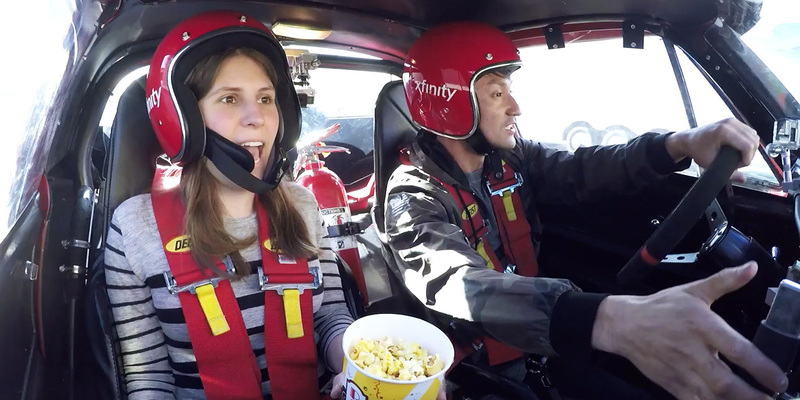 Would it be hyperbolic to say that a couple of Fast and Furious fans are taking the ride of their lives in this new mini-movie for Xfinity? Sure, but it’s true, unless these two adventurous movie lovers somehow ever find themselves in an actual—not a carefully staged—high-speed car chase with fiery explosions, airborne vehicles and nitrous oxide. The participants thought they were seeing a sneak preview of the upcoming action flick, The Fate of the Furious, when in fact they ended up re-creating a scene from the Universal Pictures release, complete with stunt drivers who worked on the film and vintage American muscle cars used in the famous franchise. Their reactions don’t disappoint. But the question remains: How in the world did they not spill their popcorn? The two-and-a-half-minute spot, from ad agency Goodby Silverstein & Partners, adds some layers of complexity to the typical punk’d-style video by shooting in a single take, with no computer-generated effects, and mirroring step by step what viewers will see on the big screen when The Fate of the Furious opens April 14. But don’t fret: No contest winners were harmed in the making of this commercial. The fans, chosen from more than 3,000 entries via social media, won a trip to Los Angeles, a day at Universal Studios and what they thought was a “drive-in” sneak peek of the film. "The brand is committed to doing more nontraditional work because it gives people a chance to interact with the brand in different ways." Adweek visited the set, which was a sprawling power plant near the port of Long Beach, where the fans went into a warehouse, equipped with a massive film screen, and sat in Fast and Furious hero cars, a red Corvette Stingray and a Plymouth GTX. Just as they settled in with their popcorn to watch bits of the movie, the action started IRL. Their seatmates, ostensibly fellow fans but actually professional stunt drivers, handed them helmets, revved the engines and kicked off a chase that mimicked the movie’s adrenaline-packed cat-and-mouse pursuit through the streets of Manhattan. “I feel like you’re in on this,” screamed unwitting but quick-on-the-uptake passenger Michele Fisher to her driver as the race began. What followed, for both fans, was a lot of yelling, smiling, swearing and laughing. That wall was fake, as was the scaffolding and the flower shop that got destroyed during the rubber-burning melee. In the film, Vin Diesel’s character, Dominic Toretto, has gone rogue, and his colleagues try to catch him during a penultimate four-wheeled scene. There are harpoons involved, but those couldn’t get approved for the ad campaign. Pieces of the movie are woven into the commercial to show how closely it replicates the flick. Each car had five GoPro cameras to capture the fans’ shock and awe, while drones flew overhead and multiple cameras picked up each stage of the chase.